"A Story of Another Earth"
This is the story of an Earth devoid of humankind. Man and his ancestors have simply never been… but in his absence, new civilizations have grown and prospered. The setting is a small island called Sankami, somewhere in what would be Earth’s Pacific ocean. Eight sentient species have evolved here, each with their own laws, customs, and beliefs. The one thing that unites them all is the story of three Gods which came to the island fifteen-hundred years ago, an event which formed the basis of their society. However, even in this the eight sentient species are in conflict… The great city built in celebration of the Day of Three Gods now stands divided by stone walls, its original unifying purpose now forgotten. 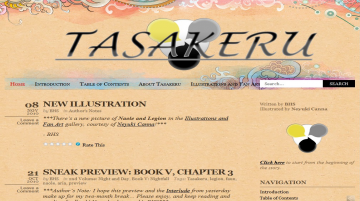 Tasakeru has not been reviewed yet. Tasakeru has not been recommended yet.